Note: This article was originally published on an old website of mine exactly one decade ago today - October 24, 1999. It has been edited and updated for this review. --Poe Ghostal, "A Haiku for Weed Killer"
Just who - or what - is this thing called Weed Killer? This is his story. 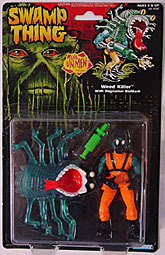 Weed Killer is an action figure from the 1991 Kenner Swamp Thing line, based on a short-lived cartoon show. He was one of the "Un-Men," evil henchmen of Dr. Anton Arcane, a mad scientist who was out to kill Swamp Thing. I got the Swamp Thing and Weed Killer figures for Easter. Why my parents chose Weed Killer over the other bad guys, I don't know. Maybe it was the bright orange jumpsuit; maybe he was the only other figure there; maybe it was just fate. Whatever the cause, I received Weed Killer, and thus action figure history was made. Sort of. I played with both Weed and Swamp Thing for a little while. I distinctly recall playing with them in the back of my grandfather's car as we drove around with my dad to visit family graves, as we used to do every Easter. After a few weeks, though, I lost interest in Swamp Thing. But I kept Weed Killer around. Why, you ask? For a few reasons. First, there's that bright orange uniform. Very eye-catching. Then there's the whole mutated-janitor thing he's got going on. The hunched back, the mottled green skin, the gas mask, the glow-in-the-dark eyes - he was just weird, and I loved him for it. He was also particularly well-sculpted for an action figure of that time. Best of all, he had no real background - he was just a random bad-guy henchman created for the cartoon. That allowed him to participate in all sorts of different adventures with different action figure lines. Most toys back then were 5" tall, and Weed Killer matched that. He used his Big Five articulation to fight the Teenage Mutant Ninja Turtles, Cable, Robocop, Batman, Spider-Man, the X-Men, and so forth. He helped out Shredder, Magneto, Stryfe, the Joker - he was basically a temp henchman for all my bad guys. I can just see him getting up in the morning, wondering what his name would be and what mega-maniacal super-villain he would be working for that day. As with most toys of its vintage, the Swamp Thing toys were all about the gimmicks. There were six versions of the former Dr. Holland, each with a different play feature: color-changing paint, spring-loaded arms, glow-in-the-dark plastic... all the sorts of things you would have expected on an early '90s toyline. The gag for the Un-Men was that they all had a large rubber mask which fit over their head to turn them into some sort of new monster. 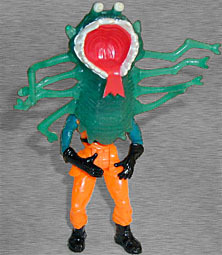 Weed Killer's "BioMask" is a big multi-limbed bug called "Boglurker," apparently because someone confused a greenskeeper with an exterminator. Weed Killer eventually retired from henchman duty and discovered to his surprise that he had received the ultimate honor that could be bestowed upon one of my action figures - he was given a spot in the glass-encased Shrine, right next to the other two hench-temps, Soaron Sky Sentry and Warduke. Welcome to immortality, Weed Killer.